Our Magictec dimmable LED string lights are a great decorative accessory to illuminate indoor and outdoor spaces, at home or work. They work especially well in giving a festive, romantic, or cozy touch to special occasions at any time of the year. Their design and contraption makes it easy to wrap the lights around trees, branches, shrubbery, furniture, and home/office signs. Create a warm, cozy, or romantic ambience indoors or outdoors this holiday season with our bright and versatile SOLAR LED lighting system. The bendable wiring in the setup enables the lights to be arranged over and across Christmas trees, Bonsai, furniture, staircases, and other such structures suitable for lighting decor. The insulation and lacquer coating on the wiring ensures water-resistance and safety. The unit is designed to be energy-efficient and eco-friendly. It brings an elegance and sparkle without compromising on build-quality. You do not have to purchase similar products from sellers located abroad and then regret substandard quality or late shipments. We guarantee what we make and sell. Our starry lights will be a great addition to your festivities! The string is adjustable over and around many kinds or forms and surfaces, but please do not over-bend or hyper-extend the wiring. Also, do not connect the lights. For all normal use, the product comes with a 12-month warranty. LED string lights, warm-white glow lends a cozy and festive touch to varied areas such as garden, patio, bedroom, living room, deck, pool, yard, pathway, etc. ; superb as a decorative accessory during weddings, holiday parties, festival occasions; also usable at retail and business locations. Made from thin and bendable copper, 72 feet length, durable enough to expirement with any shapes. 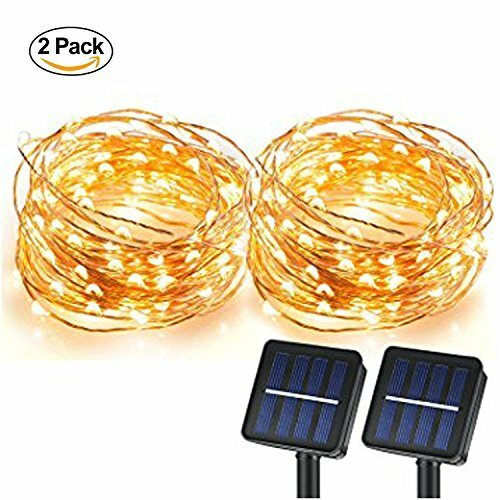 These fairy lights are waterproof so can be used outdoors as well.Strength brightness can illuminate the entire room; copper wiring is insulated, so will not overheat; remains touch-safe after 15 hours of continuous use; low power consumption. No wire required, just place the solar panel where there is sunlight and it will work aumatically.The 100 LED starry lights are arranged at a 4" bulb-to- bulb spacing on a water-proof and lacquered 20 ft long and 4mm thick copper wire, which can be bended into multiple shapes; 360 degree viewing angle. No battery or electricity required, charge by the sunligh for 6 hours, can work up to 10 hours or more when fully charged. The outdoor string lights will automatically turn on when it's dark and turn off during the day. If you have any questions about this product by Magictec, contact us by completing and submitting the form below. If you are looking for a specif part number, please include it with your message.